Meganisi is an island located between Lefkada and Aitoloakarnania. It is the largest island in the cluster of Prigkiponisa, hence its name. The municipality of Meganisis includes the islands of Skorpios (population 2) and Sparti. The island has three villages: the central village of Katomeri (population 492) and the ports of Vathy (145) and Spartochori (453 inhabitants). 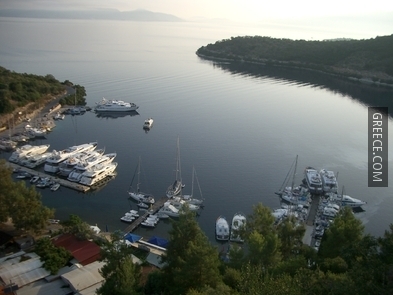 There is also a harbour at Atheni Bay used mainly for fishing boats. Traditional architecture, hospitable inhabitants, peaceful way of living, blooming landscapes and the deep blue create an incredible combination that will make you stand in awe. 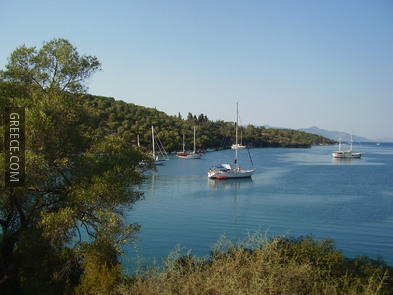 In antiquity, Meganisi was called Tafos (grave) and along with the other islands between Akarnania and Lefkada, such as Kalamos, Kastos, Atokos and Arkoudi, formed the cluster of Tafioi Nisoi (grave islands). During the Copper Age, it was the main base of the pirates Televoes or Tafians. After the demise of the Tafians, Meganisi had the same history as Lefkada up to the Middle Ages. During the Venetian occupation, the first organised settlements appear on the island. Due to feudalism, the island did not have the chance of economic growth and therefore, the increasing population was poor and in misery. In the War of Independence, Meganisi has an active role, being a refuge for many well known personalities, such as Kolokotronis, Karaiskakis and Androutsos. Local general Dimotselios Ferentinos marks the history of the island, as he participated in multiple battles and sieges, bringing the land one step closer to freedom. Population increased until the dawn of the 20th century, thanks to the inhabitants turning to sea trade, as well as the considerable cultural activity that developed here. During World War II, the inhabitants actively participated against the Germans, paying a heavy price. In 1951, the barren land compels many inhabitants to immigrate, although soon afterwards, those who were left behind turned once again to sea and the nautical sector. Finally, after the 1970s, the island turned to tourism, in an effort to create a strong economy. The three villages of the island have a number of accommodation choices and tourist facilities, for every budget. There are also few bars, clubs, and a number of restaurants to enjoy fresh fish and local delicacies. 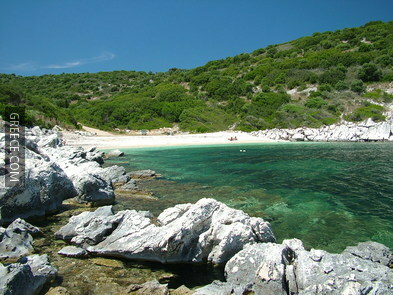 On Meganisi, a number of beaches await for you. Among the most well known, are Ai Giannis, Spilia, Pasoumaki, Ampelakia, Atherinos, and Limonari. Papanikolis cave: The island has a plethora of marine caves, the most well known being that of Papanikolis. It is a cave on the southwestern part of the island, thirty meters deep, with a sandy beach inside it. Tradition says that this was one of the hideouts of the Papanikolis submarine during World War II. Monastery of St. John the Baptist: The monastery of St. John the Baptist is built on a pebbly beach, on the western part of the island. Although not architecturally rich, it boasts an important history. According to tradition, it was built before 1477, and it was destroyed by pirates who threw the icon of St. John at sea; the icon was later tangled in a fisherman's net. In 1800, monk Ioannis Patrikis provided financial help to rebuild the monastery. 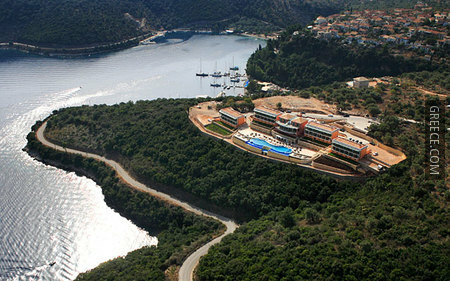 Meganisi is regularly connected to Lefkada during summertime with a car ferry service from Vathy and Spartochori, lasting 25 minutes. 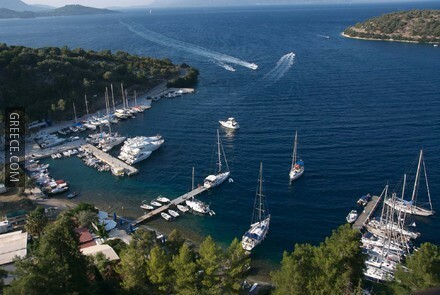 There is also a route connecting the island to Ithaki and Kefallonia. There is a regular bus service, connecting the three settlements of the island. During summer, the service is enhanced with more routes per day.